Stir all ingredients (except lemon peel) with ice and strain into a cocktail glass. 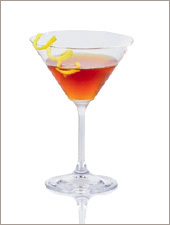 In a shaker half-filled with ice cubes, combine the brandy, lemon juice, sugar, and grenadine. Shake well. 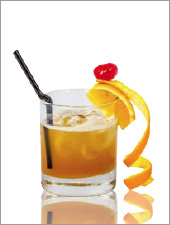 Pour into an old-fashioned glass and garnish with the cherry and the orange slice.